Low prices. OrangeSmile.com offers car hire service in Malaysia on the lowest-rate-guarantee basis, since we work with car suppliers directly. For your search criteria in Malaysia, we always select and show the best rental offers. The car reservation process consists of 3 simple steps: (1) search for available cars for your dates in Malaysia; (2) select your car type; and (3) fill in the booking forms. Once the reservation is completed, you will receive a confirmation voucher to your email address. During the booking process, please check your rental conditions. To pick up your car at the rental point in Malaysia, you need to provide our confirmation voucher, your driving license and a valid credit card. The final payment is normally carried out at the pick-up point. Our car hire points in Malaysia accept VISA, MasterCard, etc - please check your rental conditions. At the pick-up point, please read the handling manual and check the car for present defects. 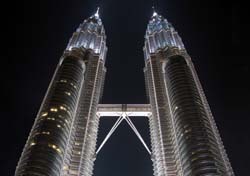 OrangeSmile.com wishes you a pleasant journey to Malaysia! The car hire reservation system OrangeSmile.com allows renting a vehicle in Malaysia within 10 minutes. Our largest database of car suppliers enables us to provide you a rental car in Malaysia at the cheapest rate ever possible. At rental locations in Malaysia we offer the following car sizes: mini, compact, economy, standard, premium and luxury. The following car types are available in Malaysia: Sedan, Hatchback, Jeep, Cabriolet, Coupe, Minivan and Minibus. There are interesting architectural landmarks in Malaysia, such as Penang Bridge. The length of the bridge is 13.5km, which makes the bridge the third longest in the world. Travellers are also recommended to visit the largest temple in South East Asia – Kek Lok Si. The temple features a mix of several architectural styles. The Temple of Snakes is a no less important religious building. The temple amazes its visitors with its exotic design and very unusual altar. The altar is covered with tenths of dangerous snakes, but despite that all tourists make memorable photos with the altar. The key to this puzzle is simple – all the snakes don’t have poisonous fangs and thanks to a special incense the snakes are very calm and absolutely not aggressive. In case if you need to cancel your reservation already at the rental office in Malaysia, please let us know by dialing the number indicated at the bottom of your voucher, or by using the link at the bottom of the voucher. This way you will correctly cancel the reservation through our website.